Twelve of your favorite Peanuts gang adventures are now available in one dazzling edition! It’s the adventures of Charlie Brown, Snoopy, and the rest of the Peanuts gang! Where will Snoopy’s imagination take him today? Will Charlie Brown ever kick that football? Will Linus ever let go of his blanket? 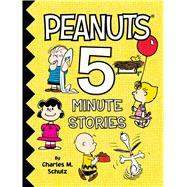 Find out in this treasury of twelve favorite Peanuts stories, each of which can be read aloud in five minutes. This sweet collection is perfect for busy little Peanuts fans who are always on the go! Kick the Football, Charlie Brown!